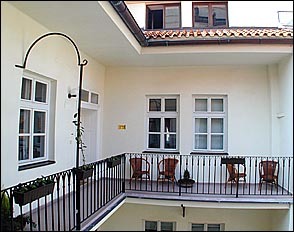 Hotel Metamorphis is located in the former Blue House in the Tyn courtyard - a part of the Old Town of Prague known as the "Ungelt". 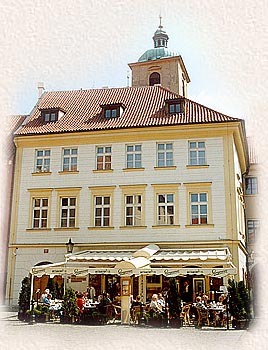 The Tyn courtyard is located between the majestic Tyn church on the Old Town Square. 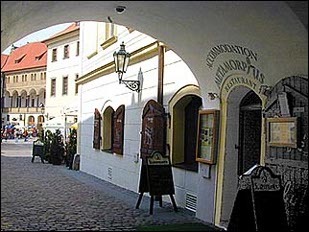 The Tyn courtyard is located between the majestic Tyn church on the Old Town Square and the Church of St. Jacob, and was once a market area (the name of Ungelt originates from "ungelts" = custom duties paid by merchants). The building and courtyard are protected by Unesco. Three houses stood here originally and after a fire in 1689 they were rebuilt and reconstructed by P.I.Bayer. The building contains the original eastern gate of the Ungelt. 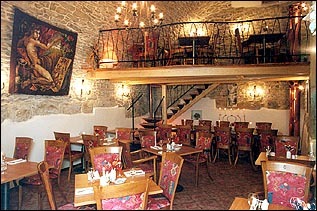 The original ceiling in the basement, where there is now a restaurant, dates back to 1689 and is protected as a valuable historical monument. 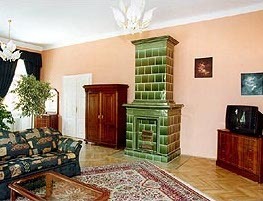 Every room is originally and tastefully decorated and quite different from the other rooms. Each room is equipped with all comforts including TV with satellite reception, direct dial telephones, security system and private bathrooms as a matter of course. 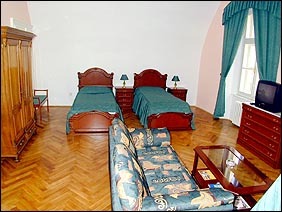 We offer 10 double rooms, which can be equipped with an extra bed on request, and 2 suites: one with fully equipped kitchen and one with a study. A perceptive visitor will surely be delighted by the abundance of plants and foliage and by the original paintings of the contemporary Czech artist Miloslav Holec. The Pizza Café & Restaurant on the ground floor is open daily from 9AM until 1AM. Outdoor seating on the terrace in the Tyn courtyard is covered by a large marquee. The Club Restaurant in the gothic cellar is open daily from 11AM until 1AM; the atmosphere of the club is complemented by pleasant recorded music and live music in the evenings with lighting effects. 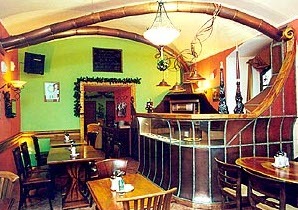 The menu includes Czech and international fare and steaks from the grill. 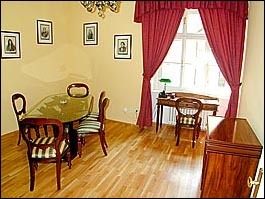 Easy access to public transport - a few minutes on foot to the Staromestská (line A) and Námestí republiky (line B) subway stations. Parking is available in the hotel courtyard. 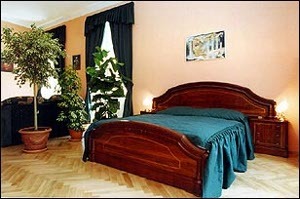 We offer discount for reservations prepaid 10 days or more in advance - rate "AP" (Advance Purchase). 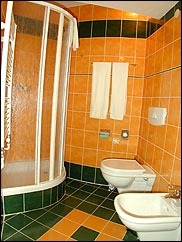 but do not include city tax 21,- CZK person/night. Children up to 2 years free (baby cot). Children up to 12 years 50% discount. Parking . 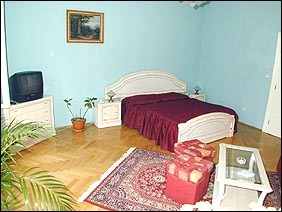 . . 600 CZK (18 EUR) /day.